The Latest News is that Staff Selection Commission has released result of SSC CISF Exam 2014 on the official website which is mention in the end of the post. These qualified candidates will be called for the 2nd stage of Physical Endurance Test (PET) / Medical Examination which will be conducted on various dates for qualified candidates. Call Letters for SSC CISF PET Exam will be released very soon on the official website of SSC. Those candidates who had appeared in the exam and waiting for the Result can download their Result from the direct link provided in the end of the post. Shortlisted candidates can get their PET call letter from this direct link whenever it gets released on the official website. This is noted that PHYSICAL ENDURENCE TEST (PET) is MANDATORY FOR THE POSTS. · Long Jump- 2.7 metres (9 feet) in 3 chances. · High Jump - 0.9 metres (3 feet) in 3 chances. · There shall be no minimum requirement of chest measurement for Female candidates. · Those candidates who are declared not qualified in Physical Standards, i.e .height and chest, may prefer an appeal, if they so desire, to the appellate authority present on the PET ground. The decision of the appellate authority will be final and no further appeal or representation in this regard will be entertained. Weight- Corresponding to height for all posts. Note - Physical Endurance Test (PET) Will NOT CARRY ANY MARKS BUT WILL BE OF QUALIFYING/ELIMINATION NATURE. NOTE -I- Candidates will have to undergo PET / MEDICAL Examination. NOTE-II- Only those candidates, who secure qualifying marks in Paper I of the written examination as may be fixed by the Commission at their discretion, will be shortlisted for Physical Endurance Test (PET)/ PST and medical test. 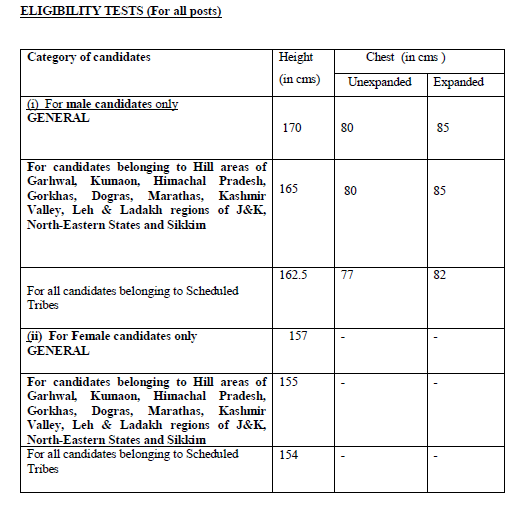 Paper-II of shortlisted candidates who qualify in PST/PET will only be evaluated. Candidates will be called for Interview based on their combined performance in Paper-I and Paper-II.